It may not be as famous as the Rialto Bridge or the Bridge of Sighs, but the Accademia Bridge, a.k.a. the Ponte dell'Accademia, is an important pedestrian thoroughfare across Venice's Grand Canal. The bridge is located in the final loop of the S-shaped Canale Grande, just before the canal feeds into St. Mark's Basin. It connects the sestiere or quarter of San Marco with Dorsoduro, and it's convenient if you're on your way from the Piazza San Marco to the Galleria dell'Accademia, the Peggy Guggenheim Collection, or the Santa Maria della Salute Church. ABOVE: A view of the Accademia Bridge from the San Marco side of the Grand Canal. The bridge connects the Campo San Vidal with the Campo della Carità. The original Accademia Bridge was built in 1854, when the city inaugurated a steel bridge designed by English architect A.E. Neville (who also designed the original Ponte dei Scalzi near Venice's Santa Lucia Railway Station). It was replaced by what was intended to be a temporary wooden bridge in 1932. Half a century later, in 1985, the city held an architectural competition for a new bridge design; in the end, however, the crumbling Mussolini-era bridge was replaced by a new wooden replica of the 1932 structure. 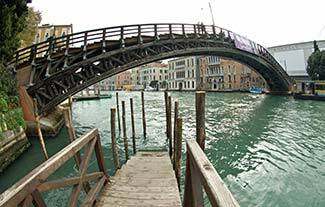 In the last few years, Venice's former mayor made noises about building a modern replacement for the Accademia Bridge (this time with a corporate sponsor), but public opposition--fueled by delays and cost overruns in building the Ponte di Calatrava over another stretch of the Grand Canal--have put the mayor's ambitions on hold. Instead, the existing bridge has been slated for a €1.7 million overhaul: its first renovation since 1948. From San Marco, follow the yellow arrow signs to "Accademia," go through the Campo San Stefano, and exit the square on the south side (past the former Church of San Vidal) on your way to the water. From Dorsoduro, follow the yellow "Accademia" signs to the Gallerie dell'Accademia and the Campo della Carità, where you'll see the bridge. For more Accademia Bridge photos and information (including where to find the Accademia vaporetto stop, public toilets, and a canalside pizzeria patio), see the next page.